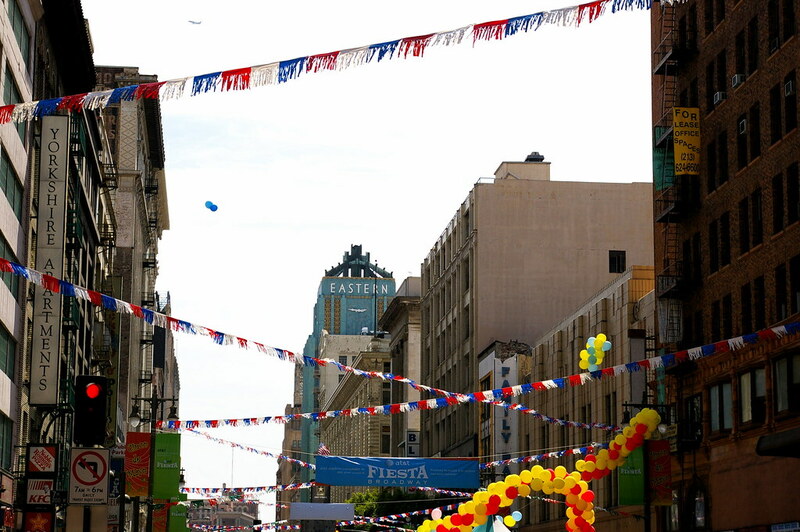 Fiesta Broadway, the nation’s largest Cinco de Mayo event, is returning to Downtown L.A. for its 21st year – and with the celebration comes bus detours as many streets Downtown will be closed off for the massive event. Detours will begin at 6:00 p.m. on Saturday and continue through 6:00 a.m. on Monday. Hill, Broadway, Spring, Main and Los Angeles streets will be closed to traffic between Temple Street and 4th Street. In addition, all east/west streets from Temple Street to 4th Street will be closed to traffic. 2, 4, 30/31, 33, 40, 42, 45, 68, 70, 71, 76, 78/79, 83, 84, 92, 96, 333, 439, 485, 487, 730, 740, 745, and 910. Both the Metro Red Line and Purple Line serve the event and those wishing to attend should get off at either the Pershing Square Station or Civic Center Station. Map of streets affected by Fiesta Broadway. Courtesy of Fiesta Broadway. Read the full press release from Metro after the jump. Go Metro to celebrate Fiesta Broadway’s 21th anniversary on Sunday, April 25, and leave your car behind, forget about traffic and parking hassles and save on gasoline. With more than 500,000 visitors expected to attend the festivities in a 12 square block area around Broadway Street, Metro is the best way to travel to downtown Los Angeles. Metro Rail serves this area with stations at Pershing Square and Civic Center. 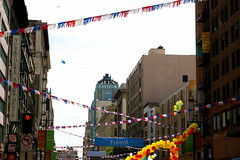 Fiesta Broadway, the largest outdoor Cinco de Mayo celebration in the United States, will feature live entertainment, booths and street vendors on Broadway Street between Temple Street and 4th Street. Metro Buses traveling in and around downtown Los Angeles will be detoured around Fiesta Broadway festivities beginning at 6 p.m. Saturday until 6 a.m. Monday, April 26. Hill, Broadway, Spring, Main and Los Angeles streets will be closed to traffic between Temple Street and 4th Street. In addition, all east/west streets from Temple Street to 4th Street will be closed to traffic. Due to Fiesta Broadway activities, Metro Bus operations in the downtown Los Angeles area may experience some service delays. All Metro service affected by the street closure will be rerouted. These included Metro lines: 2, 4, 30, 31, 33, 40, 42, 45, 68, 70, 71, 76, 78, 79, 83, 84, 92, 96, 333, 439, 485, 487, 730, 740, 745, and 910. For specific route and schedule information, visit the Metro Trip Planner at Metro’s website www.metro.net or call Metro at 1 (800) COMMUTE, 1 (800) 266-6883.